Thoughts of THAT Mom Thoughts of THAT Mom: I Need My Grandmother! I'm thinking of flying her up here to Michigan. I do love her, and would love to see her as would the kids. I must admit, though, that I want her here for purely selfish reasons. I want some Southern cooking. And no one does Southern cooking better than Grandmother. Let's face it. They can try all day long, but even Cracker Barrell doesn't have Southern cooking down right, up here in Michigan. Are you getting hungry right about now? 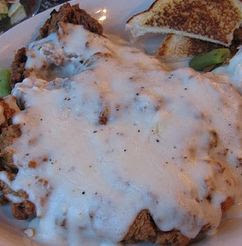 Top that chicken fried chicken with loads of thick cream gravy. 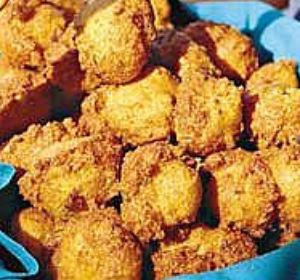 Add mashed potatoes (again, with LOADS of thick cream gravy) and some crispy fried okra and you've got my dream meal right about now. You top that off with some thick "Texas" toast with which you sop up all the left-over gravy. Doesn't the okra look scrumptious? 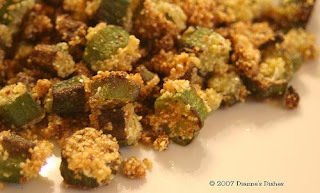 Did I mention that fried okra is my absolute favorite food? I'm so deprived up here in Michigan. What's a Southern girl to do? And that gravy? It's best when you make it out of the chicken grease. You know, the fat & grease left over after you've fried the chicken? True Southern cream gravy is made with the grease, flour, & milk. The thicker, the better. What? What's that you say about healthy eating? Yeah. Ignore that for this post. This is Southern food. Healthy and Southern don't exactly go hand-in-hand. And breakfast! NO ONE fries crispy bacon like my Grandmother. Not even me. Add to that eggs (fried in the bacon grease, of course), biscuits, and of course...THICK cream gravy. Made the same for breakfast, lunch, & dinner. Again, made in the bacon grease! YUM! Again, if you're reading this blog for health today, you'll want to leave right now. There is nothing even remotely healthy about Southern food. Unhealthy is the POINT of Southern food. Today is not about health for me. It's about comfort. And NOTHING comforts (& fattens) like Southern food. 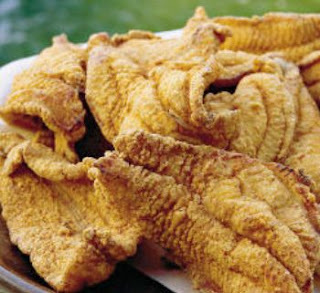 How about some Southern-fried catfish? To truly top off any Southern meal, one must have TRUE, Southern sweet tea. And by "Southern" sweet tea, I mean tea so sweet you wonder which it has more of: the tea, or the sugar. I'm not personally a fan of true, Southern-sweetened tea. (I know...the HORROR!) However, my mom is and to this day lives off of several glasses of sugar...err...I mean tea...a day. Anyone else with me? Anyone want to cook me up some Southern food? What are your thoughts on flying? Like. Today? I'm hungry now. Excuse me as I go cook something. Southern. So, did you book your grandma a ticket yet (LOL)? I actually did call her & tell her that I needed some of her cooking. She offered to mail some to me, but said if I wanted her up here I'd have to drive down and get her.